Following the successful debut launch in 2018, French Connection has announced the launch of its new bridal collection for Spring 2019. An eclectic capsule of both contemporary and classic wedding attire for brides and their bridesmaids, the collection is made up of entirely new designs. A collection of ten pieces in total have been designed as an evolution on the debut collection, while retaining the recognisable, modern feminine French Connection identity. For the bride, find classic floor length silhouettes in delicate shades of white, fused with contemporary pieces that put an alternative spin on traditional wedding attire. Building on the success of last season’s hand-embellished designs, Spring ‘19’s collection includes three timeless variations of intricate, hand-sewn beading and embroidery, each bringing a new element to these timeless dresses. As a follow up to last season’s alternative bridal two-piece, the Clandre Vintage Jumpsuit ticks the box for brides choosing to opt for a contemporary look on their big day. Featuring a delicate lace, body and sleeves with vintage inspired mushroom pleat frill and self-covered buttons, this jumpsuit is truly unique piece. A cool, elegant choice, perfect for those looking for something a little different, or simply an evening outfit change. A soft sorbet colour palette shapes the bridesmaid’s dress collection. Perfectly complimentary to the collection’s bridal designs, each dress features a unique decoration of its own; from floral embroidery to beaded blossoms and delicate lace, also perfect for summer wedding guest dresses. The collection will be available in-store from 18th February 2019, however you can pre-order on the French Connection website from today. PRE-ORDER FROM THE FRENCH CONNECTION BRIDAL COLLECTION HERE. 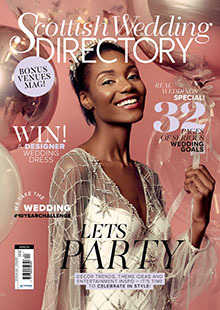 LOVE THE HIGH STREET WEDDING COLLECTIONS? CHECK OUT THE NEW DUNE LONDON BRIDAL SHOES FOR 2019! Nearly half of all married couples wish they’d had a gift list! Dune’s wedding shoes for SS19 have arrived – and there are styles for brides AND grooms!